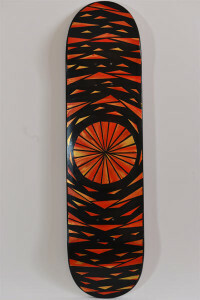 I am pleased to announce that I will have another skateboard deck in the annual Venice Family Clinic Surf & Skate Auction. What is very cool is that I will be among some wonderful established artist but also with some of my childhood skate idols. My name is listed right above Jeff Grosso, also on the list are Tony Hawk, Lance Mountain, Christian Hosoi and Kevin Staab! It will be an honor to share walls with these legends. It is this Thursday, August 28th, from 6:30-9 at the Robert Berman Gallery at Bergamot Station, 2525 Michigan Ave, Santa Monica. 100% of the proceeds benefit the Venice Family Clinic. This is the deck of mine that will be in the auction.